Contrasting big and small fish emerged as winners this weekend when the Valdez Fish Derbies ended in the town on Prince William Sound. 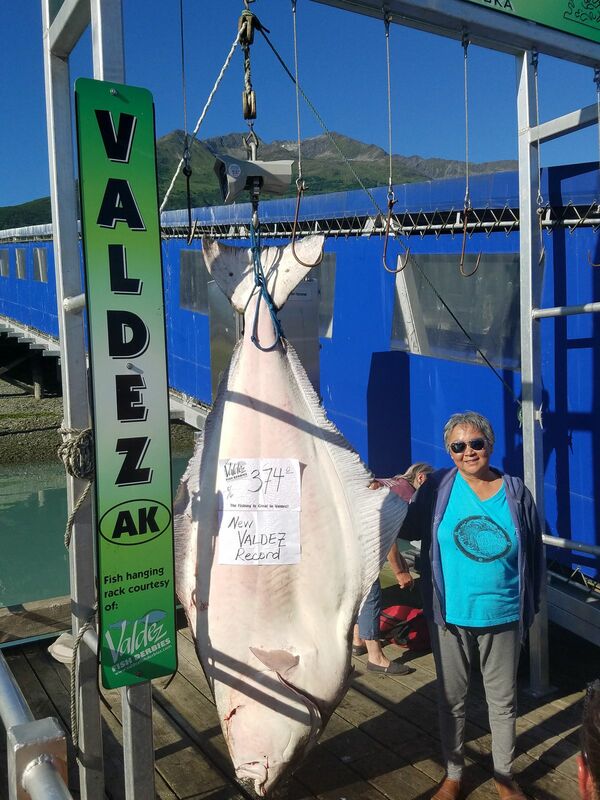 First the big: Freida Wiley's 374-pound halibut, caught Aug. 6, is the largest fish ever entered in the derby that dates back decades. The Valdez angler took home $15,000 and the satisfaction of a 108-pound margin of victory over runner-up Tim Stadtmiller of Fairbanks. Both anglers fished aboard the Dan Orion charter boat. Now the small: Cole Baxter's 15.6-pound winner in the Valdez Silver Salmon Derby becomes the second-smallest winner in derby history. Jim Burzinski's 15.1-pounder landed 46 years ago remains the smallest winning fish in derby history. Perhaps just as lucky as those two anglers was Roger Johnson of Montana, who held the winning ticket for a $10,000 cash prize drawn at the awards party after the derby. Johnson was camping when his ticket was drawn and did not immediately hear about it. 1) Freida Wiley, Valdez, 374 pounds; 2) Tim Stadtmiller, Fairbanks, 267 pounds; 3) Brett Fickler, Nebraska, 197 pounds. The Alaska Department of Fish and Game is warning visitors to the Denali Highway to be prepared for 12-hour road closures this weekend and the following week. The highway is a popular destination for hunters, anglers and berry pickers in September. Closures are scheduled 8 p.m. to 8 a.m. on Sept. 9, 11 and 13 at the highway's west end some four miles east of Cantwell. One lane will be kept open during the day. The 135-mile-long gravel Denali Highway from Paxson to Cantwell connects the Parks and Richardson highways. The Nelchina caribou hunt is one of Alaska's most-popular hunts with some 14,000 permits distributed to various hunters. Anyone wishing to trap in the Kenai National Wildlife Refuge must take a trapping orientation class and snaring seminar 9 a.m.to 5 p.m. Oct. 28 at the refuge's environmental education center. Trappers who have previously taken the class need not re-attend. Trapping permits for the 2017-18 season will be available beginning Oct. 5 at refuge headquarters. For information, call refuge officer Joe Williams (907-260-2852). Trail lovers are being sought as applicants for one position on the Outdoor Recreation Trails Advisory Board, which evaluates proposals for the Recreational Trails Program and Land and Water Conservation Fund. Since the turn of the century, the programs have invested some $30 million in trail projects across Alaska. Successful applicants will have experience and interest in outdoor recreation and multi-use trails. Contact state trails program manager Darcy Harris (907-269-8699, darcy.harris@alaska.gov) to receive a questionnaire, which must be submitted along with a letter of interest and resume.